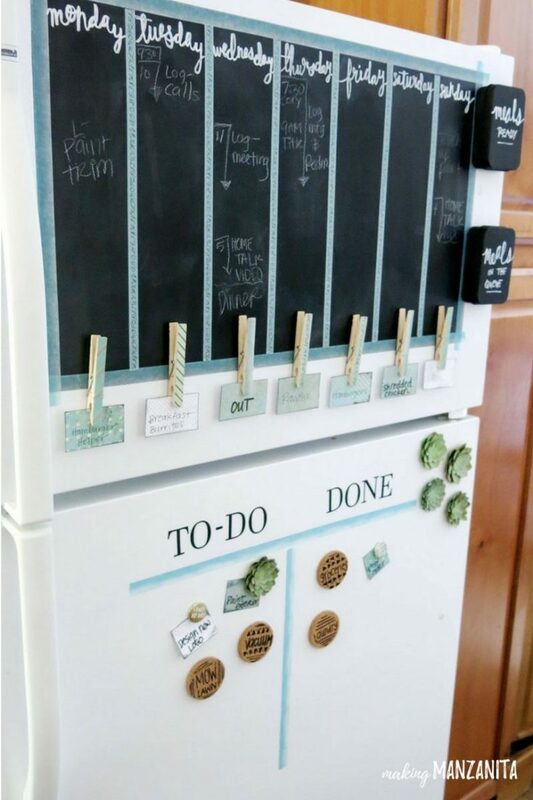 A home command center is a great way to keep your family’s life organized. It is a centralized place to keep your family’s calendar and important paperwork, helping you stay organized and keep your family on schedule. Are you in need of a command center? 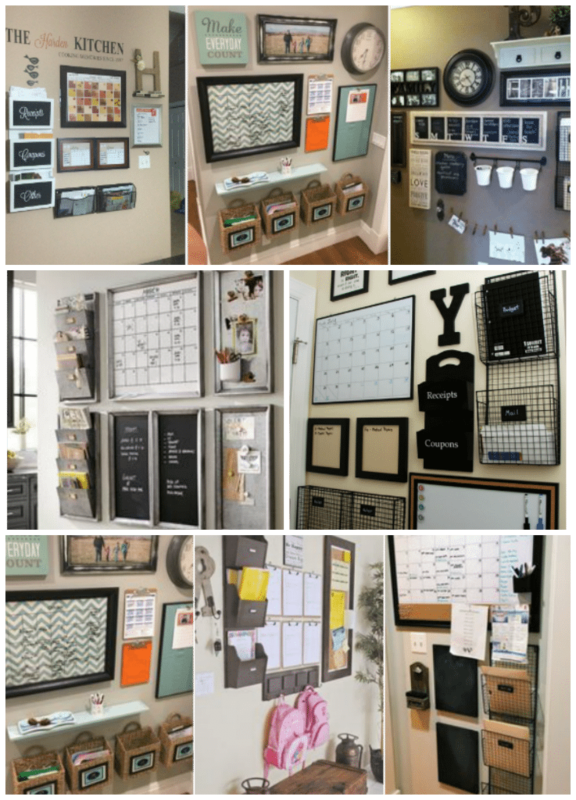 I had been having all these cute and crafty organized command centers come up in my Pinterest feed. While I didn't think I needed one or even had room for one, the universe must have been telling me differently. After missing appointments, by way of forgetting to write them down, forgetting to put them on my calendar or putting them on my calendar and not setting a reminder/alert. I heard the universe loud and clear. But let me tell you that my first stab a creating and implementing a family command center was a bit of failure. I won’t call it a complete failure because II realize that as things change… things have to change. So it is only a partial failure. Even though it never really worked, I am blaming it on the fact that our lives have changed so much that it needs to be revamped. The thing about a family command center is that just like no two families are the same. The command center of no two families will be the same either. There are a couple of factors that come into play when building your family command space. To make your family’s command center work for your home, its best to personalize it according to your family’s needs. But most command centers feature a few basic necessities to make it work well. Here are some things to consider and inspiration on how to set up an effective home command center. The biggest thing is you want your command center to serve its purpose and be functional. For me, I get so sick of mail and clutter on my kitchen counter. The kitchen counter is like the family dumping ground. The kids come in and leave their papers there, the mail gets sat there. Hubby and I are guilty of dropping things there as well. So my command center will be an organized space for all of the different things that end up residing on my counters. My command centers purpose is operation clean counters. Now while you want it to have functionality, you also have to think of the space you will have. Depending on the amount of space you have, you can be limited in what you can actually put in the space. I have seen people put command centers in hallways, outside of bedrooms, dining rooms, kitchens, and even laundry rooms. The positioning goes hand-in-hand with functionality. For instance, I can't put one in the living room and expect that it will alleviate my cluttered counters. So the flow of your home matters. I just love the creativity! In my old home, I could have done an entryway command center that would have been AH-mazing! But not so much in my new home, as there is no real “entryway”. When building your family command center be sure to keep these three things in mind. And do what works for your family and your home! Now that we have started to think about the command center, let’s get to building your command center. The first step in creating a great home command center is picking the perfect location. You’ll need to choose a place that is easy to access and in plain sight of everyone in your family. Your home command center needs to be in a location that everyone can see on a daily basis. Some easy locations to consider are the kitchen, family room, and mud room. After you have found the perfect location for your home command center, start thinking about the components your family will need within the planning station. Think about the ways your family will use the center to determine what’s right for you. 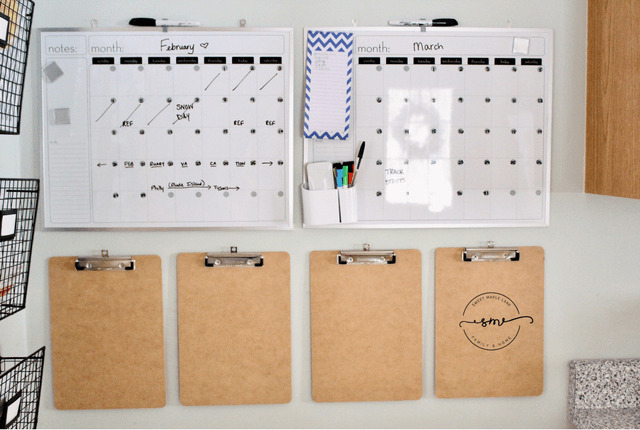 Start by hanging your calendar in a central location, then work around the calendar, adding items as needed. Make sure your calendar is big enough to write everything your family has to do each month. 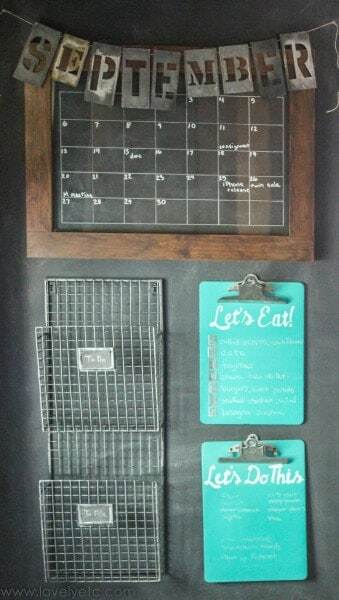 Around your calendar, consider hanging a message board for your family to communicate with each other, a daily menu, and a file station for important papers that need to be addressed each day. In addition to hanging important items on the wall, it’s also a good idea to include storage space in your home command center. Hooks are a simple way for kids to hang up backpacks, lunch boxes, and coats. Storage boxes or baskets are other great opoptionsor your home command center for sorting mail and storing smaller everyday items like keys and loose change. Another simple way to make room for everything you’ll need in your command center is to install a shelf. A shelf is a great place to hold supplies, like pens, paper, and scissors. It’s also a perfect place to rest everyday items you need while on the go, like sunglasses and sunscreen. The best way to ensure your home command center is effective is to make sure it’s organized. That means throwing away outdated paperwork, clearing away excess items that don’t belong, and sorting the mail each day. It’s also a good idea to take a few minutes each week to organize the station and ensure everything is up-to-date. I hope this serves as inspiration for you to get going with your own command center. It certainly has me ready to redo mine. Stay tuned for the reveal of the transformation. There is more than one way to skin a cat. And while no cat fur has gone harmed here, this serves as inspo for creating your own family command center. Carrie from Lovely, Etc. is like me. She needed to take her kitchen counters back and came up with this beautiful, but simple solution to make that happen. Chelsea from Making Manzinita needed order and visual display of what was happening. So she chose to make a command center in a space that won’t be overlooked - The Fridge. This is proof that you can get creative in creating your command center and do what works for you. I just love the creativity! 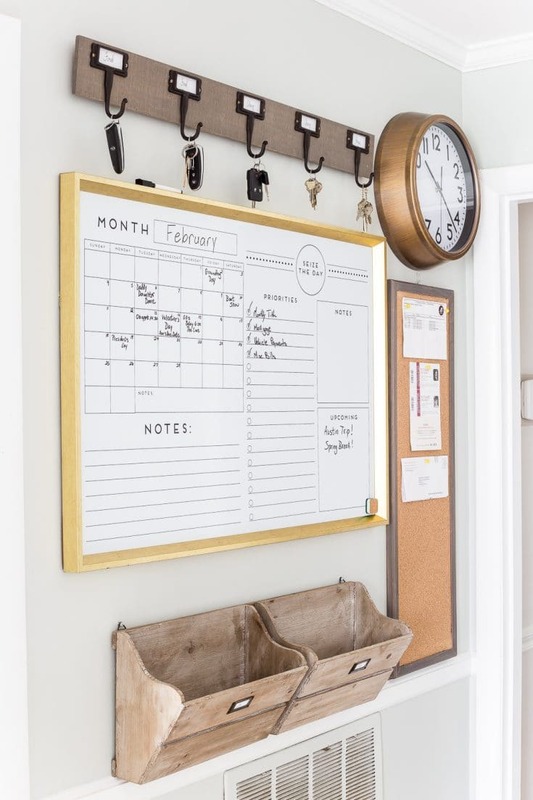 Lauren from Bless'er House pulled together this simply beautiful command center to help keep her family on task and to organize all the things. 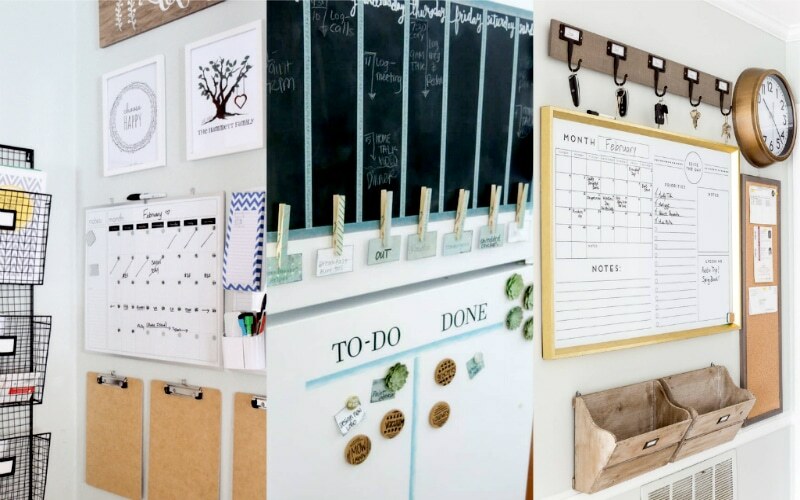 Gina for Sweet Maple Lane's simple spin on organized functionality to keep the family in order and on task. Do you have a family command center? If not, where could you use one? Tell me about it in the comments below.